A box of toys you haven’t touched in years. You never play with him anymore. Donatello was always your favorite one. Down the blood soaked, ancient road of war. The plastic guns exchanged for ones that kill. The childish games replaced with grown up death. My mind still echoes with your childish laughter. Twenty one black bells toll for your innocence. As much as I miss the happy little boy? Oh, he was the best! Seriously though, your son has an amazing father, just as you have an amazing son. Thanks, Red! That means a lot coming from you! I’m blown away. Sobering even. Would comment on this one, but after dealing with ‘Some Wore Green’, I’ll have to get back to this one with a fresh mind. Happy Friday and thanks for another poem. Stephen!!!! I love it!!! Damn me. I knew if I read it tonight I would be second guessing my own thoughts. What a fun tag, huh? This is brilliant. And your son is very blessed to have you. My heavens, Ali! If I can get you second guessing yourself, then that is indeed an accomplishment! As always, thank you for your kind words! So glad you joined the tag!! effects of war and a loss of innocence. Will you mind if I repost it with the others? Thanks for those kind words, and yes, by all means, feel free to repost it. I’ve been by several times and then something always happens before I can get my comment made. I can’t remember if my son had a favorite turtle; but I did make several colored head bands for the boys at his birthday party one year. Yeah, those turtles were pretty popular! I’m glad you found it so. Thanks so much for stopping by! hey there, i loved this poem its very touching, ur great!!! Incredible. Loved the transition and reference from youth to adulthood, from playthings to life-ending things. Incredible span of time in such a short and precise poem. Thanks again for treating us all with another mind provoking read. Hey, Andy! Thanks for stopping by! And thank you for the kind words. I’m glad you enjoyed it. I loved your poem. I’m glad you stopped by my blog otherwise I wouldn’t have gotten to read it. My son was the blond blue eyed boy who then became a heroin addict. Fortunately he has been clean for three years. He had to leave his hometown to stay clean. I still have his favorite stuffed animal in my room to remind me of that sweet innocent boy. Thanks for stopping by and leaving those kind words. And best of luck to you and your son. Well, I don’t know how much credit actually belongs to me, but yes, he has grown up into a fine young man. 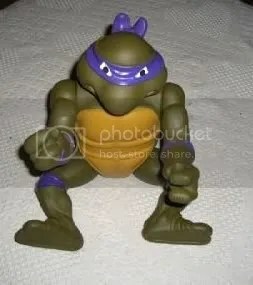 I remember Donatello being the intellectual or genius among the four characters. Your son must have been a very smart kid to have chosen him as a favorite. 😉 I am, in all sincerity, moved by the poem, by your bond with your son, and by his comment above. (sniff) To be able to put that bond into words with much clarity, with effective contrasts, and extending it to what’s going on with the world — now that is truly impressive. 😉 Cheers. Thank you for those kind words. Yes, I do think this was one of my better efforts. I’m glad you see you feel the same way. Thanks for stopping by! I wanted to mention Brendan’s comment as well. Kinda gets you right ‘there’, ya know? I’m left wondering how much the Ninja Turtle actually misses the little boy. Poignant. Sad. True. Such is life . . . sometimes. Nice job, Jelly Roll . . .
*Mikey was always my favorite. Go figure. A belated thank you to all who left a comment here. Your comments mean a great deal to me. It’s a yearning that never goes away. Heck, I’m 46 years old and my mother still has it. Is your son back yet? I hope he’s doing well. Thanks for stopping by. “Childish games replaced with grown up death” that line really got me. It must be brutal for any parent in this situation. I can’t imagine it. No one can imagine it who hasn’t gone through it. Every time you hear or read news of a soldier getting killed over there you think the worst; you just can’t help it. The fact that they impose a communications blackout makes it even worse; he couldn’t even call me to let me know he was ok. After awhile you just get numb to it. Then he came home, which was wonderful, but also brought with it new challenges as well. Thanks for stopping by, Sarah.